Johanna Brenner considers a variety of strategies by which caregiving might be socialized outside the institutions of family and household. Dinner at Jernstoberiet commonhouse, Denmark, 1999. The chapters in this book were first presented at a conference in the Real Utopias Project on the design of public institutions that could...create conditions that would facilitate much more deeply egalitarian gender relations within the family over both caregiving and employment. The conference was anchored by Janet Gornick and Marcia Meyers’ essay “Institutions that Support Gender Egalitarianism in Parenthood and Employment.” They argue that in order to reconcile in an egalitarian manner the interests of men, women, and children within the emerging dual- earner/dual-caregiver model of the family, three clusters of institutional innovations are needed: 1) a generous mechanism of paid parental leaves for caregiving activities which is allocated to mothers and fathers individually, thus requiring fathers to “use or lose” their paid leave time; 2) effective working-time regulations that limit full-time work hours and raise the quality and availability of reduced-hour work; and 3) an expansive, universal program of early childhood education and care. The other chapters interrogate these proposals, examining their ramifications and possible limitations, elaborating alternatives, and exploring their relationship to the broader problem of emancipatory social change. In the essay below, Johanna Brenner considers a variety of strategies by which caregiving might be socialized outside the institutions of family and household. As long as we are talking utopia, we might consider moving beyond the social-democratic welfare state and the family/household as the major institutions for organizing care. Given that proposals for anything like the Nordic welfare state system are already “off the charts” in the current US political climate, to envision even more radical change may appear to take us well outside the bounds of a “real utopia” project. Certainly, the reforms proposed by Gornick and Meyers are important and to be supported. However, I want to argue for going further toward socializing and democratizing the organization of care over the life cycle. At their most developed, social- democratic welfare state programs attempt to make the family/household workable by expanding public responsibilities for early childhood education and care (freeing parents from having to carry that labor entirely themselves) and subsidizing parenthood, especially in the early years of life, so that parents can withdraw temporarily from the labor force. Shorter working weeks, as Gornick and Meyer propose, provide parents more time to carry out the everyday tasks of care throughout children’s growing-up years. These programs are meant to lighten the burdens on the household and redistribute those that remain, so that both men and women can be equally responsible for the work that still must be done. Although these policies do socialize some of the responsibility for caregiving work, they leave in place the family/household as the major institution for organizing care. Relying on the family/household for the work of care limits possibilities for moving toward gender equity and undermines social solidarity, especially under conditions of relative scarcity. Further, although it is certainly possible for work/family policies such as paid parenting leave to gain more political support than they have now, I would wager that significant gains in this area will require broad and powerfully mobilized social movements. Under such circumstances, we ought to be ready with workable alternatives that will inspire and motivate people to join such movements and take advantage of the possibilities for radical reforms that they open up. I offer two strategies for transcending the family/household system and the social-democratic welfare state by socializing responsibility for care and democratizing care-providing institutions. First, I explore cohousing communities — a more collective form of living that broadens and democratizes the group of people sharing the work of care. Second, I explore democratic and participatory forms of organizing public services, and consider how these might engage both care workers and those dependent on their care (for example, parents of young children, families of elders, elders themselves) in mutual governing relationships. Collective, democratic, and participatory institutions expand the possibilities for gender equity at both an individual and group level. Many studies of women’s participation in democratic decision making, particularly at the local level, demonstrate their increase in confidence and leadership skills and, often, changes in their expectations about gender relations in personal life. In the practice of deliberative decision making, under supportive conditions, participants learn to present their own needs and interests in relation to those of other individuals and the larger group. Through the deliberation process, individuals are often compelled to reevaluate their own interests in light of what they learn about others, and in consideration of what will work best for the group as a whole (Fung and Wright, 2003; Mainsbridge, 2003). The deliberative decision-making process opens up an arena for questioning inequalities in life situation, providing an opportunity for both men and women to interrogate men’s privileges. The culture of radically democratic institutions values equal participation and holds the group responsible for ensuring this occurs, so that it is not left up to women as individuals to fight for their place at the table. Democratic practices certainly do not in themselves challenge the gender divisions of labor which are at the heart of gender inequality. But they create a far more favorable ground on which women can press their claims for men to share more equally the burdens and pleasures of care. More indirectly, radically democratic institutions organizing care work expand the ground for gender equity because they support the deepening of social solidarity. Social solidarity, in turn, underlies political support for the kinds of programs Meyers and Gornick propose. It is true that a sense of common purpose and group connectedness within a workplace or a neighborhood is never automatically generalized to a larger collectivity. On the other hand, the highly individualized institutional relations within which the family/household carries out its responsibilities for care work, and in which family members are forced to negotiate within their workplaces and households around who is going to take up that work, tend to reinforce rather than counter individualistic striving. Collective forms of living and working at least push in the opposite direction. Even two-parent families face barriers to achieving gender equity because the burdens on the household remain quite extensive. Shorter working weeks will help, but are not sufficient to manage the workload. Inevitably there is a poor fit between the demands of market work and the time needed for care work in the household. (If we were to include elder care in this discussion, the time burdens on families would be even more onerous.) For all the reasons we already understand, women take up this work much more than men do. Even in Sweden, the country where the proposed reforms are most developed, families must still provide high levels of care work; women are much more likely than men to engage in part-time work; and gender segregation in occupations and across sectors remains very high. It is true that the gender wage gap in Sweden is far narrower than in the US. But, because women are much more likely to work part-time, Swedish women’s overall incomes are lower, and differences in the time that fathers and mothers spend on care work compared to wage work continue to be quite large (Thornqvist, 2006). Further, although single mothers do not sink into abject poverty in social-democratic welfare states, lone parenting is difficult enough that it cannot but have a coercive effect on mothers’ choices about staying in relationships. Cohousing offers promise, because adults share caregiving in reciprocal relationships among an extensive group of people. Cohousing combines individual living units with a central common space. Housing is designed to maximize social interaction, while also providing individual privacy. Cohousing members are expected to share responsibilities for organizing collective life, serve on committees, and participate in decision making. They are also expected to participate in community meals, although how this is organized, the frequency of the gatherings, and the intensity of expected participation varies across communities. A large, comfortable space that can accommodate the whole community for meals and social gatherings is at the heart of cohousing. The common house can include, in addition to a dining room and kitchen, a children’s space, a library, recreation room, meeting rooms, a workshop, an office, shared laundry facilities, and guest accommodations (allowing individual units to remain relatively small, because visitors can stay in the common facilities. Studies on cohousing residents find that participation in neighborhood activities and reciprocal helping are much higher than in their previous housing situation (Williams, 2005). Cohousing seems to be especially beneficial for households with children, because parents (whether single or coupled) have expanded resources for dealing with their care responsibilities — built-in child-minding, help when children or adults are ill, and so forth. Community members can easily establish relationships with the children living there if they want to, and this seems to happen — although it is generally not a requirement of membership (Wann, 2005). Single parents benefit particularly, not only because there are more adults to help care for children but also because shared tools and common facilities (such as laundry rooms) reduce individual outlays for consumer durables, and make available otherwise unaffordable resources — for example, workout space or office equipment (Williams, 2005). At the moment, participants in the US cohousing movement are middle class, even relatively affluent. But cohousing is not inevitably a middle-class privilege. In Denmark it also began as a middle-class movement, and those who wanted to build cohousing communities faced skepticism from financial institutions and the government. Legislation passed in 1981 — the Cooperative Housing Association Law — made it easier and less expensive to finance cohousing. 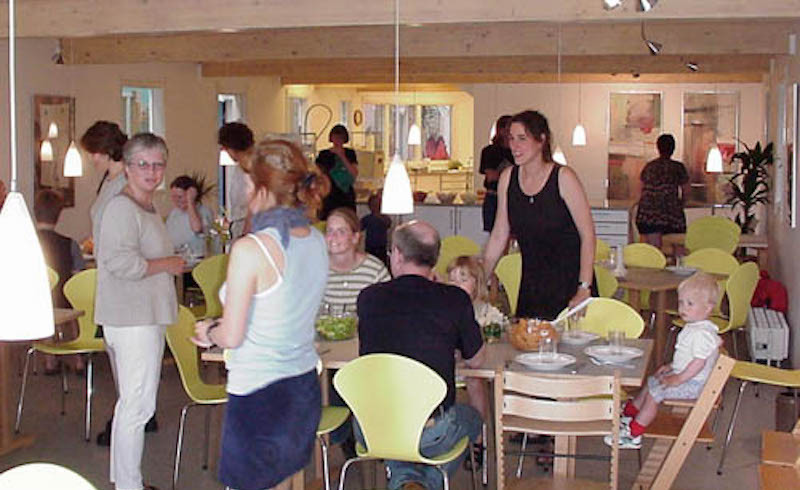 Today, cohousing in Denmark has broad support and, most importantly, government programs have made it more affordable and available to modest-income households. By 1994 there were already ten rental co-housing communities in Denmark, financed with government-sponsored loans (Milman, 2001). In the US, recent local experiments have broadened access to cohousing. Strategies for opening cohousing to working-class people include government subsidies, sweat-equity, and internally generated loans. In Boulder a cohousing development was built using multiple resources: Habitat for Humanity built four homes, nine were financed by the city’s affordable housing program, and twenty-one are market-rate (Orelans, 2004). Common Ground, in Aspen, Colorado, is exclusively comprised of permanently affordable units, and was built on land provided for free by the city and with construction costs subsidized by the county (Bader, 1998). The inclusion of rental housing along with owner-occupied units has also emerged as a strategy for incorporating people who cannot afford a home down payment into cohousing communities (Ferrante-Roseberry, 2002/03). Bank lending rules are a major obstacle to combining rental and owner-occupied units, but could be overcome through government subsidies and alternative financing sources (Wann, 2005). These initiatives demonstrate the possibilities for incorporating cohousing into nonprofit community development, and even public housing programs. Currently, single-family home ownership is promoted by federal government programs administered by local housing authorities, nonprofit local community development organizations, and national organizations. Cohousing experiments could be encouraged by these institutions through public programs and public subsidies, rather than being available only to those who have the money to make the substantial private investments necessary to create co-housing projects. Cohousing appears to combine many of the positive aspects of earlier communes, while avoiding the forced intimacy and lack of privacy that seems to have been a principle source of destructive conflict. Cohousing communities also have their share of conflicts; however, over time the cohousing movement, drawing on the extensive experimentation in and experience with consensus process over the last decades, has developed governing structures and decisional practices that seem quite workable (Christian, 2001). Living and decision making that are more collective require people to develop various kinds of personal skills, and learning these skills has become part of the generalized culture of the cohousing movement (Daub, 2005; Renz, 2006a, 2006b; Wann, 2005). While the suburbs continue to expand and individual American homes have become gigantic, a counter-movement within the US appeals to the desire not only for greater community but also for economic and environmental sustainability. Cohousing, eco-villages, and, in more mainstream venues, the “new urbanism,” express a willingness to reduce individual living space in return for more convivial, walkable, neighborly, public space. Cohousing interests me particularly because it requires and produces levels of democratic participation, individual capacities for deliberation, and innovative structures that lay the basis for broader democratic community. Of course, left to themselves, cohousing groups can be particularistic and insular. But as part of a broader movement for social change, they offer not only a model for collective engagement in the work of caring for ourselves and others, but also the dense social networks that are the basis for grassroots political projects (see, for example, the ways in which women’s extensive neighborhood ties arising from reciprocity and shared labor historically laid the ground for many different kinds of community-based movements). The communal spirit that motivates cohousing could also be mobilized in building a movement for public, universal early childhood education and care. (For an example of cohousing communities as the catalyst for a local environmental justice movement, see Wann, 2005). The limited research on cohousing available in English has not explored gender relations in the communities or within households. However, accounts of participants’ experiences in cohousing are full of comments by women, and women are often the public representatives of cohousing communities. Women seem to be completely engaged in the decision-making process, and many report satisfaction with their growing ability to negotiate contention and conflict. When difficulties over participation and the fulfillment of work obligations are discussed, neither men nor women are singled out as more problematic. In terms of work for the cohousing collective — gardening, cooking, cleaning the common house, and so on — it seems that the division of labor is not particularly gendered, though this conclusion is based on sparse and anecdotal evidence. Whether women’s engagement in participatory governance has translated into a more equitable gender division of labor at this point remains an open question. One of the challenges of advocating for publicly provided services, including caregiving, in the US is the widespread concern about “free riders” and suspicion of government. Nonetheless, these negative attitudes coexist with an appreciation (albeit sometimes sentimental) for the value of community. A potential for social solidarity exists, even if it is overwhelmed by individualistic striving within a highly competitive and insecure political economy. But does the social-democratic welfare state have a future in a period of global capitalist restructuring? Fiscal crises, and the rise of neoliberal political movements, threaten to dismantle welfare state programs. On the other hand, state programs and institutions that are universal, as they are in the Nordic welfare states, penetrate deeply into society and have the ability to mobilize constituents in their defense. The current picture seems to be fairly mixed — certainly, overall spending has not been as deeply cut as conservatives might have wished, or as welfare state supporters might have feared. Yet quality has been eroded in some areas (for example, by increasing the number of children per caregiver), and new forms of service delivery — particularly vouchers and the rise of both nonprofit and private care providers contracting with the state and competing with state services for state dollars — have the potential to create a two-tier workforce, as well as two-tier services. This process, of course, is highly developed in the US, but it has even begun to work its way through the public sector in Sweden — the bastion of universal public services (Blomqvist, 2004). The ideology of “consumer choice,” embedded in paeans to the market and attacks on the rigidities of the state (and public sector unions), is a central element of the neoconservative political discourse that is fueling this process of privatization. As surveys of public opinion show, neoconservative ideology does not fully express the complicated attitudes that many people have toward the welfare state. Still, we ought to acknowledge that consumer choice, understood as an avenue for exercising control in one’s life, reflects much actual experience. People’s real opportunities for influencing the institutions that organize social, political and economic life are indeed restricted. This is particularly so in the US, where institutions such as unions or social movement organizations — which at one time were avenues for the exercise of some collective power — are in sharp decline. Parents are especially vulnerable to discourses that play on their fears about their children and, at least in the US, their actual experiences of (to say the least) suboptimal day-care arrangements. But even when parents are satisfied with their child care, they can feel defensive about placing their children in full-time care, especially in child-care centers. One reason for the popularity of family day care is that the informality of the arrangement offers parents the illusion that they have more influence and control over how their children are cared for, since they are dealing with only one caregiver (Wrigley and Dreby, 2005). The idea of consumer choice also has power because it reflects the actual relationships between institutions that provide public services and the people who need them. While we can talk abstractly about public goods as those things we own in common, for the most part we experience ourselves in relation to public goods as consumers. Some philosophers and public policy analysts have captured the importance of institutional arrangements through which public goods and services are provided by making a distinction between public goods and “the commons,” or commonwealth. A public good is typically what David Bollier has termed an “open-access regime” — a resource, such as a lighthouse or a park, whose benefits are accessible to everyone, but which cannot be effectively allocated by market mechanisms, and so is better provided by the state (Bollier, 2002). In contrast to an “open access regime,” where users have no direct responsibility for the resource, the idea of “commons” implies an inalienable resource managed, cared for, and primarily enjoyed by a group of people cooperating with each other, committed to ensuring its availability to future generations, and capable of engaging in democratic decision making about how it will be used. It is the social relationships in the production and use of a good that make the difference between private property, open access, and a commons (Bollier, 2002; Anton, 2000). In an open access regime, although goods are not privately produced and are in that sense public, the public has no direct involvement in either administering their use or organizing their production. As users experience them, public goods delivered through bureaucratic, hierarchical, and inaccessible organizations are much closer to commodities than to a commons. Most public service delivery constitutes the public as consumers on the one side, and workers and managers as producers on the other. Now, to a certain extent this is a necessary state of things — those of us who use services are happy to rely on the expertise and knowledge of those who organize and deliver them. However, insofar as public services are organized in traditional bureaucratic forms, they are not a common project, generating the kinds of relationships between producers and users and among users themselves that create and sustain social solidarity. The way public services are produced, administered, and delivered can be bureaucratic or participatory, hierarchical and centralized, or local and accessible, with shared governance and decision making. As Bourdieu has argued, our dispositions are developed through practice, through enactment, so that ways of imagining oneself in relation to others become deeply embedded in our identities and in our habits of being and acting. When public services are produced and administered within institutions that involve shared governance and decision making, they provide the structures and experiences within which people can develop the dispositions that are fundamental to social solidarity. As bureaucratic and inaccessible as our contemporary public schools often are, in surveys people will generally express negative assessments of public education while nevertheless giving their own children’s schools high marks. Why? Because, through their children’s and their own relationship to their teachers, parents develop some sense of a shared project—they and the school have a common purpose. If this kind of feeling can be generated under the relatively alienating and alienated relations that working-class and poor parents, in particular, have with their schools, imagine what sorts of common bonds could be produced in a more collaborative institutional arrangement. What sorts of models, if any, do we have for these kinds of services? And what evidence do we have that transformations of public services toward shared governance can work? What difficulties are there, and how might they be addressed? In 2000, the Real Utopias conference engaged these issues through a discussion of empowered participatory governance. The complexities of organizing and managing empowered participatory governance within the state are many, and lie beyond the scope of this essay. They are explored well and in great depth in Deepening Democracy, the volume produced by the conference. Complexities notwithstanding, the book makes a strong case that empowered participatory governance can work. In his case study of public school reform in Chicago, which devolved decision-making to the school site where parents, teachers, and adminstrators collaborated in making policy, Archon Fung demonstrates that localizing power has to be combined with processes for accountability and oversight managed by the central school authority. Funding for technical support and training in democratic deliberation are also fundamental. Further, as Fung and Erik Wright argue, based on a comparison of different outcomes of school reform projects, the stark differences in resources that the various players bring to the table have to be equalized. Administrators exercise managerial power through their connection to the central authority, and teachers’ claims to authority based on expertise are backed up by their unions; but parents — especially working-class and poor parents — have no institutionalized base of power or authority. Fung and Wright point out that experts are generally reluctant to share power with non-experts in decisional processes, and teachers are no exception to this rule. They argue that shared governance, whereby teachers, administrators and parents truly collaborate in making school policy and solving problems, requires that parents be organized, or supported by a community-based organization — what they call a “countervailing” power to that of the insider groups (administrators and teachers) — who otherwise dominate the field. Under these conditions, they argue, schools in Chicago, Oakland, and Texas have been able to make collaborative governance work (Fung and Wright, 2003). While parents need to be organized in order to negotiate with bureaucratic insiders, workers also need to be empowered within institutions. Although teachers can use their unions and contracts to gain some job security, they are necessarily on the defensive vis-à-vis school administration. Professionals have always relied on claims to expertise as a strategy for defending their autonomy on the job. But so long as they need to defend themselves, they are unlikely to be willing to share power with others. The more secure professional workers are, the less resistant they might be to allowing others to have a say in their work. Empowering teachers by devolving decisions to the local school is a step in this direction. From the other side, parents need time for education and training (for example, in child development and pedagogy) and for participating in the classroom, or at the day care center, if they are going to be able to collaborate effectively with teachers and administrators in democratic decision making. The reduction in working hours proposed by Gornick and Meyers would be an important background condition supporting shared governance in public child care. Although we might prefer to see publicly organized and funded early childhood education and care become the norm in the US, day-care provision is dominated by for-profit and nonprofit child-care centers and family day-care providers. They will be huge contenders in any movement to expand public funding for early child care and education in the US. One way to counter their claim that they are more responsive to parental influence (through “consumer choice”) is, as I argued above, to develop models of early childhood education and care within the public schools that are accessible and democratic. Another strategy for democratizing the delivery of care has emerged in what has come to be called the “social economy” — nonprofit organizations, producer cooperatives, mutual benefit societies and worker collectives — a sector of economic activity between the state and the market. Over the past two decades, the social economy has expanded in response to needs for human services unmet by government programs. In the US, the expansion of this nonprofit sector is motivated primarily by a neoliberal restructuring of the state, which offloads public services by contracting out to nonprofits relying on non-union, low-paid, predominantly female, labor. In Sweden, Italy, and Quebec, the expansion of the social economy has also been spurred on by state retrenchment and the resulting unmet needs for caregiving services. But whereas, in the US, hierarchically managed nonprofit organizations dominate the field of government social service contractors, in other countries worker cooperatives have taken advantage of openings to create new forms of social and health service delivery. In Quebec, the expansion of worker cooperatives into the field was facilitated by a feminist social movement, with trade union support (Graefe, 2002). In Sweden, also, it appears that the trade union federations, worried about the privatization of public services, have supported public funding of worker cooperatives and other forms of non-private enterprise which contract with the state to deliver social and health services (Lorendahl, 1997). In Italy, where producer cooperatives were already well institutionalized, legislation in 1991 expanded state protection and regulation to include “social cooperatives” — worker cooperatives which are expected to provide benefits to their local community as well as to their own members. Cooperative members included, in addition to paid workers, users of the services, as well as financing entities and public institutions. The legislation also required that employment standards and benefits match those of the Italian state (Vanek, n. d.). Following the Italian model, Quebec also recognizes “solidarity cooperatives” whose membership includes those in the community using the services. Unlike in Italy, however, in Quebec the wages and benefits of workers in the social economy are not linked to those of state workers. There is good evidence that worker cooperatives in the caregiving field offer far better wages and working conditions, including opportunities for professional development, than do private firms. 4 In particular, the social cooperatives, combining worker ownership with a mandate to include users of services in decision making, create social relationships that have the potential to constitute publicly funded care services that are more like a “commons” than like consumer goods. On the other hand, they may also be used to facilitate a neoliberal agenda that undercuts public workers and their unions. While many of the services provided in the social economy in Quebec (such as home care) have never been delivered through public agencies, other services, such as community health care, have been moved out of the state sector into the social economy as a cost-saving strategy (Mendell, 2003). Locally based, responsive to local needs, supported by social movements and by their own regional networks, the organizations of the social economy in Quebec have resisted the worst consequences of the neoliberal restructuring and privatization that have devastated neighboring Ontario. Nonetheless, wages and benefits in the social economy lag well behind those of public workers, and enterprises in the social economy have little bargaining power in relation to the state agencies on which they depend for contracts (Graefe, 2002). Decisions about funding and levels of service are not made at the local level, where organizations of the social economy can mobilize support, but are monopolized by the traditional, highly centralized and inaccessible state bureaucracy. As Peter Graefe argues in his analysis of the Quebec social economy, “harnessing the social economy to progressive ends will at some point require democratizing the state” (Graefe, 2002: 258). The examples of empowered participatory governance in Porto Alegre, Brazil and Kerala, India outlined in Deepening Democracy offer hope here (Fung and Wright, 2003). While no panacea, worker-owned and cooperatively run day-care centers have the potential to incorporate parents into decision making in ways that hierarchical and non-democratic workplaces do not. The most important aspect of a worker cooperative in this regard is that workers play guiding roles in management, and exercise greater control over work processes and policies than in typical hierarchical settings. The security enjoyed by worker–owners should facilitate shared decision making and collaboration between parents and care workers, since workers’ claims to control over their conditions of work do not have to be protected from managerial intrusion. The cooperative culture that infuses the social cooperative movement and the legally mandated requirement to incorporate users in decision making encourages and enforces collaboration. Still, informal practices may undermine formal requirements for equal participation. At this point, social cooperatives are at the beginning of an exciting experiment in which, over time and no doubt through conflict as well as cooperation, the specific practices, institutional structures, and organizational scale necessary to ensure democratic participation will emerge. Of course, democratic organizations face many of the same challenges hierarchical organizations confront: how to facilitate communication, manage conflict, motivate and engage workers, exercise authority, maintain commitment — all made more complex by the dilemmas of democratic leadership and decision making. In addition, in caregiving work, as in any work that engages expertise, differences in knowledge and skills threaten to undermine equality of participation and authority. Finally, the incorporation of those who rely on services into decision making further complicates the challenges of democratic process. Resolving such problems is no easy task — but there is a huge difference between a workplace where such inequalities are not only accepted but rewarded, and one where these inbuilt inequalities are acknowledged as a problem to be overcome (Rothschild-Whitt, 1982). At the heart of the vastly expanded, publicly funded, and universal programs that Meyers and Gornick envision are two claims: 1) that providing care for people over the life cycle is a social responsibility, an obligation that reflects our ties to one another as a human community; and 2) that men and women ought to share equally in the work that these programs support, because we value gender equality, and because nurturing others is a basic human pleasure and skill that men should develop and enjoy. We might argue, and many have argued, for these programs in other ways: because they make workers more efficient; because without them our economy wastes women’s talents; because they ensure that children grow up to be productive citizens rather than drains on the society. While these arguments may be persuasive to those who hold power and make policy decisions, they are not the ideas that inspire activism — and inspiring activism will be necessary to win these significant reforms. Since caregiving workers are overwhelmingly female and predominantly women of color, and since women are also the majority of unpaid caregivers, it will fall to women to drive this movement. Alternative models for democratically organizing care work and housing will contribute to building such a movement, because they help to counter the anxieties that women experience around their responsibilities for care — anxieties that are powerfully mobilized by both social conservative and neoliberal discourses. The people involved in these experiments, the skills they can share, and the ways of working and living they have developed, offer compelling testimony to the possibilities of social solidarity and equality. 1. “Directory”, Cohousing Association of the United States, http://www.cohousing.org/directory/ (accessed December 5, 2008). 2. See “What is Cohousing?” Cohousing Association of the United States, http://www.cohousing.org/what_is_cohousing/ (accessed December 5, 2008). 3. The Elder Cohousing Network, http://www.eldercohousing.org/ (accessed December 5, 2008). 4. Two instructive examples here are the Childspace daycare cooperative in Philadelphia and Cooperative Home Care Associates in New York City. See Sloan Work and Family Network, 1999; Inserra et al., 2002; Whitaker, n. d.; Laursen, 2006. Anton, Anatole, 2000, “Public Goods as Commonstock,” in Anatole Anton, Milton Fisk, and Nancy Holmstrom, eds, In Defense of Public Goods, Boulder, CO: Westview Press, 2000. Bader, Eleanor J., 1998, “Cohousing: Collective Living for the 90s,” Dollars and Sense (January/Feburary): 22–41. Blomqvist, Paula, 2004, “The Choice Revolution: Privatization of Swedish Welfare Services in the 1990s,” Social Policy and Administration 38 (2), April: 139–55. Bollier, David, 2002, Silent Theft: The Private Plunder of our Common Wealth, New York: Routledge. Christian, Diana Leafe, 2001, Creating a Life Together: Practical Tools to Grow EcoVillages and Intentional Communities, Gabriola Island, BC: New Society Publishers. Daub, Richard, 2005, “Cozy Living: Cohousing in Libertytown, Maryland,” Z Magazine Online, July/August, online: http://www.zmag.org/zmag/view Article/13724 (accessed December 5, 2005). Fung, Archon, and Erik Olin Wright, 2003, Deepening Democracy, London & New York: Verso. Graefe, Peter, 2002, “The Social Economy and the State: Linking Ambitions with Institutions in Quebec, Canada,” Policy and Politics 30 (2): 247–62. Horelli, L., and K. Vespa, 1994, “In Search of Supportive Structures for Everyday Life,” in Irwin Altman and Arza Churchman, eds, Women and the Environment, New York & London: Plenum Press. Laursen, Eric, 2006, “The Bronx, New York: Quality Job, Quality Care,” Yes!, online: http://www.yesmagazine.org/article. asp?ID=1525 (accessed December 5, 2008). Lorendahl, Bengt, 1997, “Integrating the Public and Cooperative/Social Economy: Towards a New Swedish Model,” Annals of Public and Cooperative Economics 68 (3): 379–95. Mainsbridge, Jane, 2003, “Practice-Thought-Practice,” in Archon Fung and Erik Olin Wright, eds, Deepening Democracy, London & New York: Verso. Mendell, Marguerite, 2003, “The Social Economy in Quebec,” paper delivered at the VIII International CLAD Conference, Panama, October 28–31, available online at http://unpan1.un.org/intradoc/groups/public/documents/ CLAD/clad0047506.pdf (accessed December 5, 2008). Milman, Danny, 2001, “Where it All Began: Cohousing in Denmark,” available onlines at www.cohousing.org/cm/article/related_denmark (accessed December 5, 2008). Orleans, Ellen, 2004, “Do We Really Value Diversity?” Communities (Fall): 17–20. Renz, Mary Ann, 2006a, “The Meaning of Consensus and Blocking for Cohousing Groups,” Small Group Research 37 (4), August: 351–76. ———2006b, “Paving Consensus: Enacting, Challenging and Revising the Consensus Process in a Cohousing Community,” Journal of Applied Communication Research 34: 163–90. Rothschild-Whitt, Joyce, 1982, “The Collectivist Organization: An Alternative to Bureaucratic Models,” in Joyce Rothschild-Whitt and Frank Lindenfeld, eds, Workplace Democracy and Social Change, Boston, MA: Porter Sargent Publishers. Sloan Work and Family Network, 1999, “Childspace: High quality childcare for working families,” The Network News, 1 (3), Fall, online: http:// wfnet work.bc.edu/The_Network_News/1-3/TNN1-3_Herzenberg.pdf (accessed December 5, 2008). Thornqvist, Christer, 2006, “Family-friendly Labour Market Policies and Careers in Sweden—and the Lack of Them,” British Journal of Guidance and Counseling 34 (3), August: 309–26. Vanek, Wilda M., n. d., “Italian Social Cooperatives,” Grassroots Economic Organizing Newsletter, online: http://www.geo.coop/archives/vanek.htm (accessed December 5, 2008). Wann, David, 2005, Reinventing Community: Stories from the Walkways of Cohousing, Golden, CO: Fulcrum Publishing. Whitaker, Julie, Stu Schneider, and Margaret Bau, “Home Care Cooperatives: Worker Ownership in Perspective,” online: http://www.uwcc.wisc.edu /info/ health/homecare.pdf (accessed December 5, 2008). Williams, Jo, 2005, “Sun, Surf and Sustainability—Comparison of the Cohousing Experience in California and the UK,” International Planning Studies Journal 10 (2), May: 175–77. Wrigley, Julia, and Joanna Dreby, 2005, “Fatalities and the Organization of Child Care in the United States, 1985–2003,” American Sociological Review 70 (5), October: 729–57.